￼￼One of the most fervent producers in the West Coast dance community is musician and DJ Alexandre Mouracade - but you might rather know him as one half of tag team Split Secs or purveyor of fine underground tunes SONNS. Following up his 2013 solo debut "On My Mind" on Machine Limited - an imprint owned and operated by himself and Split Secs partner in crime TK Disko aka Travis Kirschbaum -, he went on to remix The Field's "Cupid's Head" in 2014, besides releasing material and remixes on labels like MERC, Clouded Vision, DFA, Future Classic, Gomma Records, Wolf & Lamb and more. 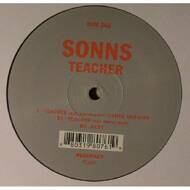 It's a particularly prolific trajectory leading up to his latest offering TEACHER - which turns out to be a more than fitting addition to SONNS' versatile back catalogue, thanks to its skillful amalgamation of electronic songwriting and floor-oriented beat design.